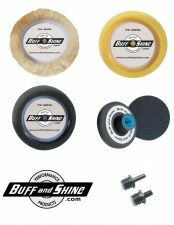 Buff and Shine 3" Tri-Pack Buffing Kit TP-3 TRI PACK BUFF KIT No. TP-3 includes three pads a backing plate and two adapters. The three pads are #301G for heavy compounding, #330G for polishing and #320G for finishing along with our grip backing plate #358. The two adapters are #DA5816 and #SP5814. The #DA5816 mounts in the grip backing plate #358 making a grip backing plate for a pneumatic machine. The #SP5814 also mounts in the grip backing plate #358 making a grip backing plate for drill mount. The MINI TRI PAC BUFF KIT was designed for small buffing areas.